Water availability in Colombia is six times that of the global average yet certain areas have only a tenth of the average levels – Colombia is the perfect example of scarcity in the midst of abundance. With its heterogeneous distribution of water resources, water security is a challenge in the land where agriculture is of growing importance. At Nexus Seminar No. 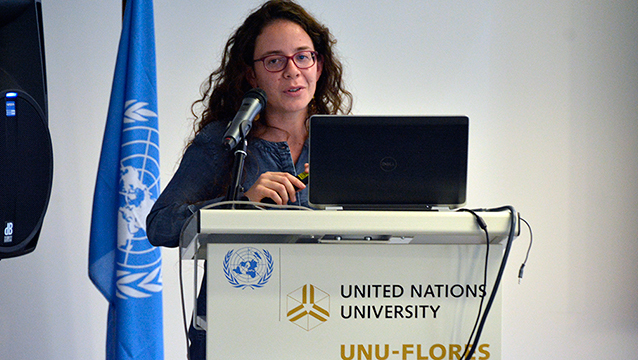 33, UNU-FLORES Visiting Scholar Natalia Jiménez explored a viable solution to Colombia’s water dilemmas and the state of current affairs in this regard in the country. In her presentation “Safe Use of Wastewater in Agriculture: Policy Implementation in Colombia”, Jiménez shared about the historical development of wastewater use policy in Colombia along with her personal anecdotes, having worked in the area over the years. The safe use of wastewater in agriculture (SUWA) looks at wastewater as a resource in face of water scarcity and through its safe use in agriculture promotes food security. 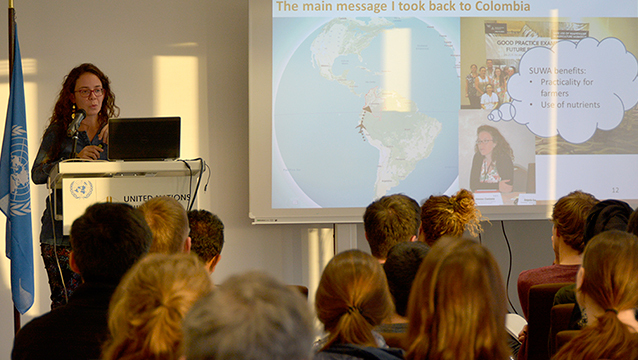 A Climate Fellow with the Alexander von Humboldt Foundation, Jiménez began by recounting her Safe Use of Wastewater in Agriculture (SUWA) journey, tracing it back from a 2016 workshop organised by UNU-FLORES in Lima. The workshop on good practice examples and future research needs sparked her drive to take on the call and exactly address the latter. Jiménez was drawn to two main benefits of SUWA – practicality for farmers and the use of nutrients – and in her current research investigates the reasons SUWA is not applied in Colombia and what the possible solutions are. Looking at the hard facts, several key points are clear: the agriculture sector in Colombia is expected to grow 2.5% annually with an increase of 44% in land area in the next 15 years, and the demand for water in this sector is also increasing at an accelerated rate. As such, wastewater use is a key alternative to increase water availability for agriculture in Colombia. While policies and regulations covering the use of wastewater may be traced back to the Natural Resources Code in 1974, direct regulation is covered only by more recent developments since 2014. When it comes to implementation, only two cases of wastewater use in agriculture have been documented in Colombia. Jiménez distinguishes between two types of actors in wastewater use in agriculture – wastewater producer and end user. Awareness of the actors involved helps elucidate the bottlenecks blocking the implementation of SUWA in Colombia and how they may be addressed. Based on the state of affairs, Jiménez highlighted how current regulation ignores both the potential of municipal treated wastewater as a resource of agriculture and the farmers as end users. This restrictive view sees wastewater only as a water resource and neglects its potential in providing nutrients. As a result, it mostly promotes the use of industrial wastewater in agroindustrial crops, when in fact Colombia is a country of smallholder farms. Jiménez elaborated on five main bottlenecks of SUWA implementation in Colombia: lack of awareness, lack of technical capacities, lack of economic incentives, sectorial thinking, and the administrative process. To address these bottlenecks, several suggestions include the use of the multi-barrier approach as outlined in the World Health Organization Guidelines (2006). This approach consists of applying measures at each stage of the process, from the treatment of wastewater to the final stage of consumption in households, thus considering health and environmental risks. Focusing on nutrients use in agriculture – as derived from municipal treated wastewater – could also help push fertiliser use down. There needs to be a balanced redistribution of responsibilities between the wastewater producer and end user to ensure effective SUWA implementation. Development of guidelines for good practices and training programmes can help increase awareness of SUWA benefits and risks. Development of SUWA pilot scale projects and stakeholder cooperation may help establish a participatory approach among different actors. In fact, at a recent workshop in Bogota, local authorities have invited UNU-FLORES to be part of a SUWA pilot in Colombia. Jiménez’s presentation inspired interesting discussions that followed – from capacity development efforts as a reflection of policy impact to more technical concerns such as the energy consumption demands in the treatment of wastewater and questions on the impact of treated wastewater on crops.